Air-Cooled & Water-Cooled to 40 Tons(180K). Air-Cooled Units with remote condenser (59K). Air-Cooled 4 - 30 Tons (49K). Water-Cooled 5 - 30 Tons (49K). Air-Cooled 1/4 - 1.5 Tons (47K). Air & Water-Cooled 2-3 Tons (85K). Portable liquid chillers are designed to circulate a fluid medium (typically water, or a water-gylcol solutions) through a process application for COOLING to temperatures between 20° to 70°F. Generally, portable chillers are offered in capacities from 1/4 to 40 tons and service single or multiple process process cooling points. These are self-contained units using a refrigerant system to chill water to setpoint. The chilled water is stored in a reservoir and supplied to the process via a circulating pump. A microprocessor controller displays process temperature and monitors the unit's operation. Since portable chillers use refrigeration as the cooling means, a method to dissipate the heat acquired from process is needed. Thus, portable liquid chillers are available with AIR-COOLED or WATER-COOLED condensers. Choosing a air-cooled or water-cooled unit depends plant environment conditions. Contact Chillers, Inc. for assistance if needed when selecting between air-cooled and water-cooled portable liquid chillers. 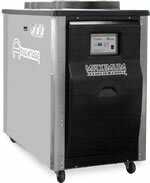 Air-Cooled units use ambient air to dissipate process heat. These units are available in capacities from ¼ to 30 tons. Advantage units are recognized as having the highest quality of parts and craftsmanship in the industry. Offered from ¼ - 30 tons capacity, each Advantage air-cooled liquid chiller offers M1 Series microprocessor controller, full parts and labor warranty for one year and excellent factory service support. For product features, specifications and pricing, click here for Advantage Air-Cooled portable water chillers. Temptek units are built for economy in price and operation, offering a microprocessor controller, scroll compressors, braze plate evaporator and internal water reservoir. Temptek chillers are available from ¼ to 30 tons. For product features, specifications and pricing, click here for Temptek Air-Cooled portable water chillers. Water-cooled units use a plant water supply source (tower water, city water, or well water) to dissipate process heat. Advantage units are recognized as having the highest quality of parts and craftsmanship in the industry. Offered from 2 - 40 tons capacity, each Advantage water-cooled liquid chiller offers M1 Series microprocessor controller, full parts and labor warranty for one year and excellent factory service support. For product features, specifications and pricing, click here for Advantage Water-Cooled portable water chillers. Temptek units are built for economy in price and operation, offering a microprocessor controller, scroll compressors, braze plate evaporator and internal water reservoir. Temptek chillers are available from 2 to 40 tons. For product features, specifications and pricing, click here for Temptek Water-Cooled portable water chillers.